The real surprise here is the fact that the CD-10 exists at all. Micromega has had a fine reputation, in particular for its range of CD players. Since its first outing in the late 1980s, the range has included what is claimed to be the first top-loading CD player, (the CD-F1 Hightech in 1987) and in the following year the first separate two-box transport/DA converter combination, though we are not convinced of the veracity of either of these claims. From this reviewer's memory, we thought both Philips and Meridian had prior claims to top-loading players and one of the early iterations of Cambridge Audio was surely the first with a two-box player? But from the outset Micromega had a real cachet for sound quality, but some of its models were hit by reliability problems with the Philips-sourced mechanisms, which was surely not Micromega's fault, but eventually led to the company's demise – temporarily anyway. And now, after a gap of several years, the company is back with a reorganised leadership and design team, a new range of products and new UK distribution. The company, still based in Paris, is now headed by one-time motorcycle-racing champion Didier Hamdi, whose other interests include the company that provides the very impressive lighting for the Eiffel Tower. He has since reconstituted the design team under the company's original founder, Daniel Schar. All this came to light on a recent visit to Paris, where the reconstituted company was formally announced. Here in the UK, distribution is now in the hands of Absolute Sounds, the company that handles many of the most prestigious audiophile companies including Krell, darTZeel, Wilson Audio, Koetsu, Sonus Faber, Audio Research and Magico. Another surprise is, that at the tail end of the most severe economic recession in recent times, Micromega's focus has been on on the affordable end of the market, the sector that has suffered most during the recession. 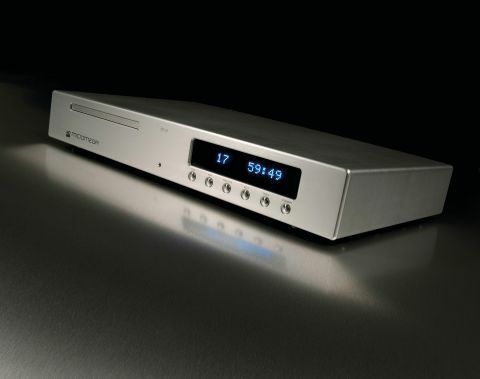 Most of the new components, which include amplifiers, CD players and tuners, cost less than £2,000, while the entry-level award winning CD player tested here costs just £799. A price which puts it in line with counterparts, from the likes of Rotel and from the mainstream end of the Marantz and Denon range. This is virgin territory for Absolute Sounds, which makes the new distribution deal all the more intriguing. As for the bits you don't see from the outside, the CD-10 is built around an R-core transformer, chosen for its narrow bandwidth, which is said to be superior in current-limited situations to the more usual toroidal solution, because it provides higher levels of interference rejection. The linear power supply is constructed in several stages to mitigate crosstalk between digital and analogue circuits. The digital section provides sufficient current to power the CD drive and the user interface – the display and associated logic. The analogue section is optimised in a different way. After rectification and filtering, a high-impedance, low-noise power section is combined with tracking regulators, in a design with a rejection level higher than 100dB. The digital section of the D/A converter has a constant power source and a very low noise shunt regulator. The disc drive in this player is a DVD-type, chosen because this kind of mechanism, is produced in very large quantities at low prices and with extremely high levels of reliability, a subject that Micromega is understandably sensitive about. The mechanisms are the latest-generation Sony KHM3413 and Sanyo SFH8450, with error correction algorithms of Micromega's own making, which are optimised for audio applications – in most cases DVD mechanisms are optimised for CD-ROM – and without some of the strategies that are not appropriate when reading single-speed CD-DA discs. It didn't take long to recognise that the CD-10 is a high-quality product and for the price, represents exceptional value for money. It just doesn't have the less desirable qualities of some other similarly priced players. There is no hint, for example, of the rather heavy-handed feel we expected, while the level of detail the player lifts off the disc easily surpassed expectations in fairness, the baby Micromega doesn't quite manage to tick all the boxes. It is not a true heavyweight. Its bass is deep enough and powerful enough for most situations, but it doesn't have the devastating authority of the very best, but then it doesn't even come close to costing what you'd expect to pay for the very best either. It is a fine, detailed, and unusually lively player and it has the rare ability to resolve instrumental and vocal detail that is simply not fully audible, using many otherwise comparable players. If there is one word that sums this player up, it would be texture. The detail is there and the bass depth and weight is creditable, though no more than this. But the sound has an unusually tactile quality, it really does seem capable of resolving the texture of some of the recordings on test. Examples being the gravelly strings and woodwind in the Castrol GTX theme from the second movement of Mahler's 7th Symphony (Mariss Jansons/oslo Philharmonic on Simax), and the exquisite opening Allegro from Brahms clarinet Quintet (fitzwilliam String Quartet and Lesley Schatzberger (clarinet) on the Linn label (the CD layer, not the accompanying SACD one, of course). There are plenty of other examples that could be given, but the basic aural feature of the player is that it has an unusual sensitivity to recorded textures and to the reproduction of fine detail generally, which helps ensure a more credible, colourful and a more lifelike, expressive quality from the discs it was fed. The Brahms recording, in particular, has a lightness of touch and an agility, a sense of life you will rarely hear in this work which can sometimes sound rather heavy-handed – though in fairness, this is more than partly a function of this particular recording. The Micromega is also more effective than most at suggesting the scale and sound of the space in which recordings are made, which in effect means it is better than most with small groups of instruments recorded in limited spaces. The subtleties of such recordings often escape lesser CD players. Although the CD-10 misses out on some of the weight and sonorities of certain CD players, it is correspondingly more than usually capable at the opposite end of the spectrum. The fine detail has already been alluded to, but what has not been emphasised sufficiently is the CD-10's very fine sense of control and inner colour, which put us in mind of the kind of quality that SACD is often much more capable of reproducing, than a conventional compact disc. A very good, expressive and subtle sounding player, the CD-10 easily lives up to and arguably exceeds expectations, based on the reputation of earlier models from this famous Parisian manufacturer.